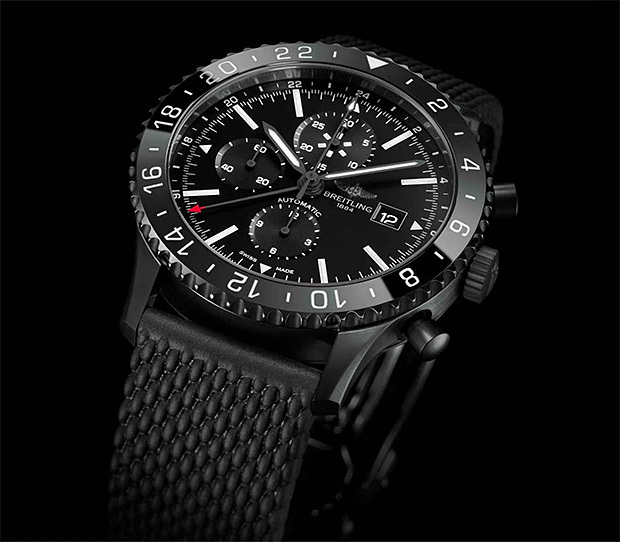 The 50s & 60s-inspired Swiss-Made Chronoliner from Breitling got a modern update with the release of the murdered-out Blacksteel model. The 46mm self-winding mechanical chrono is powered by a Breitling 24 movement and features a 24-hour dial as well as 1/4th second, 30 minute, & 12-hour sub-dials plus calendar. 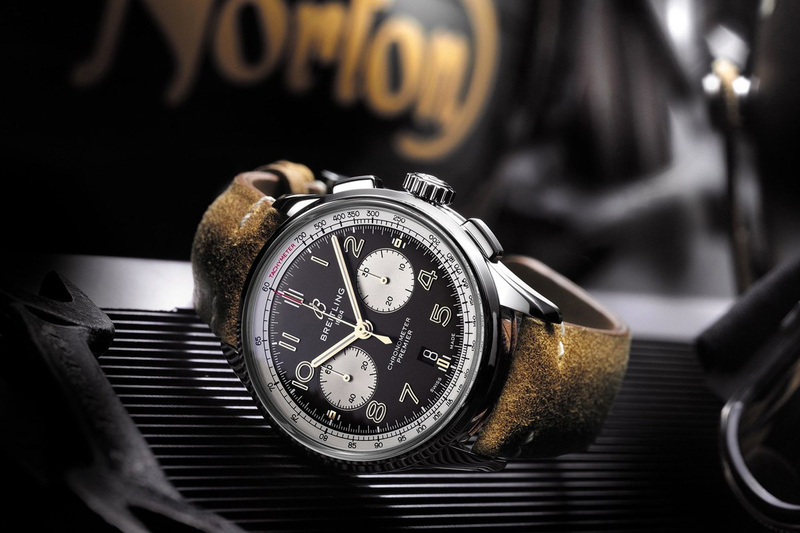 The Swiss-made Chronospace Evo B60 features a 100% new Breitling ‘engine,’ the first analog-display quartz movement developed by and for the Breitling brand. Made of Titanium, it’s a sturdy, lightweight 43mm instrument with a black dial that features two central chronograph hands as well as a 24-hour counter at 9:30, 60-minute counter, 1/10th second dial, and date aperture. Inspired by a WWII-era pilot’s stopwatch, Breitling’s Navitimer Super 8 is a 46mm chronograph with a screw-lock crown and bi-directional bezel. 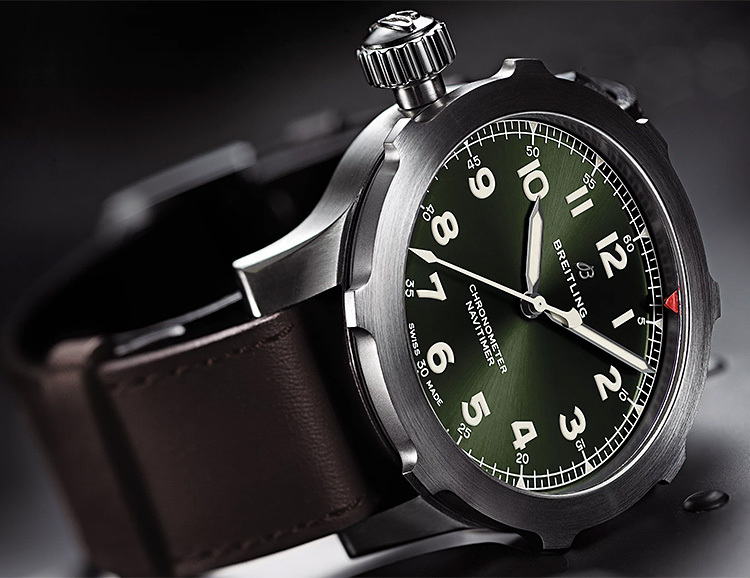 Powered by Breitling’s B20 movement, it boasts a 70-hour power reserve and is available in stainless steel with a black dial or titanium with a green dial. 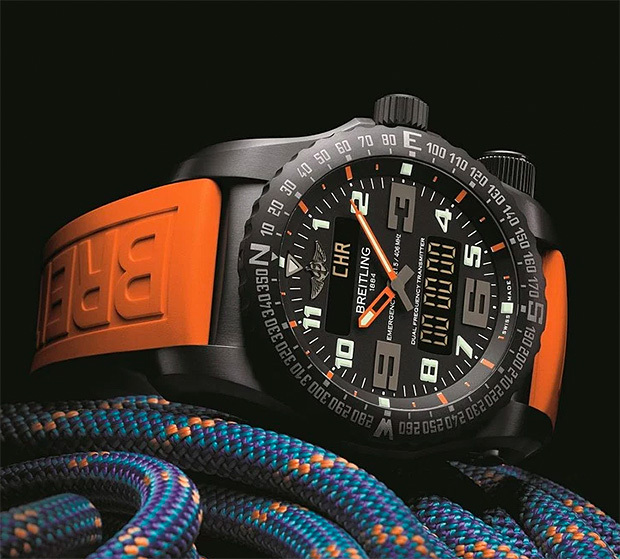 The 51mm Emergency Night Mission watch from Breitling is the world’s first wristwatch with a dual-frequency personal locator beacon. For use in search & rescue missions, it uses an internal radio transmitter & antenna to send out a homing signal. It features another first-ever function: a personal locator that links with the International Cospas-Sarsat satellite system for triggered alerts. 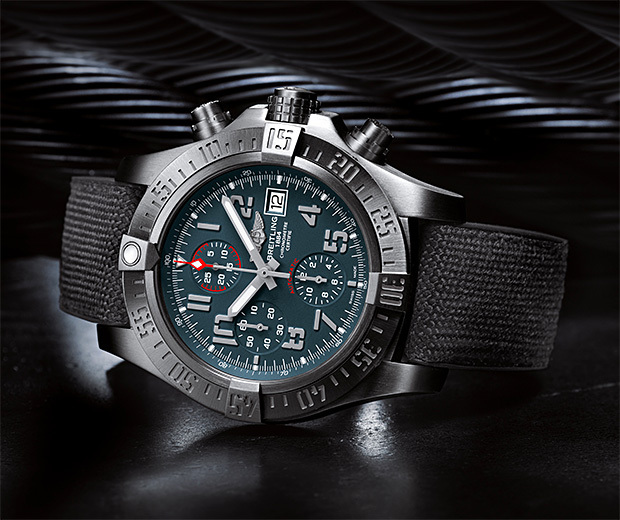 Its powered by Breitling’s SuperQuartz chronograph movement. 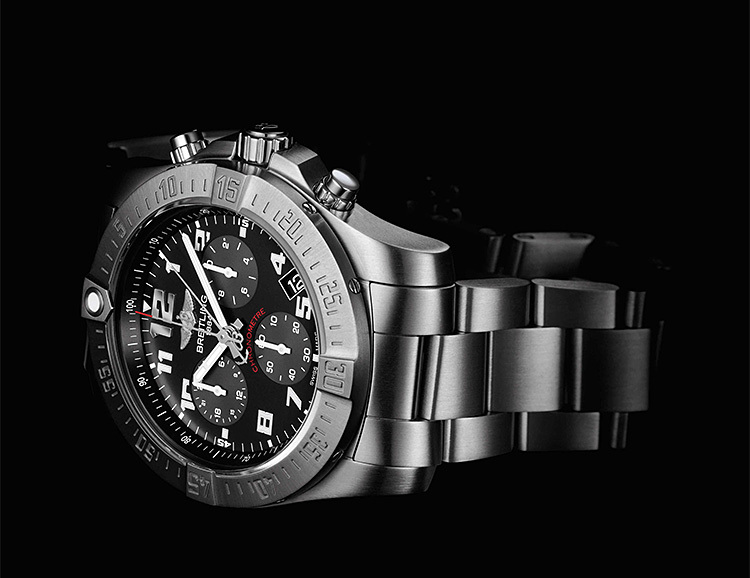 Breitling’s titanium Avenger Chrono was a popular piece that for some unknown reason was discontinued several years back. 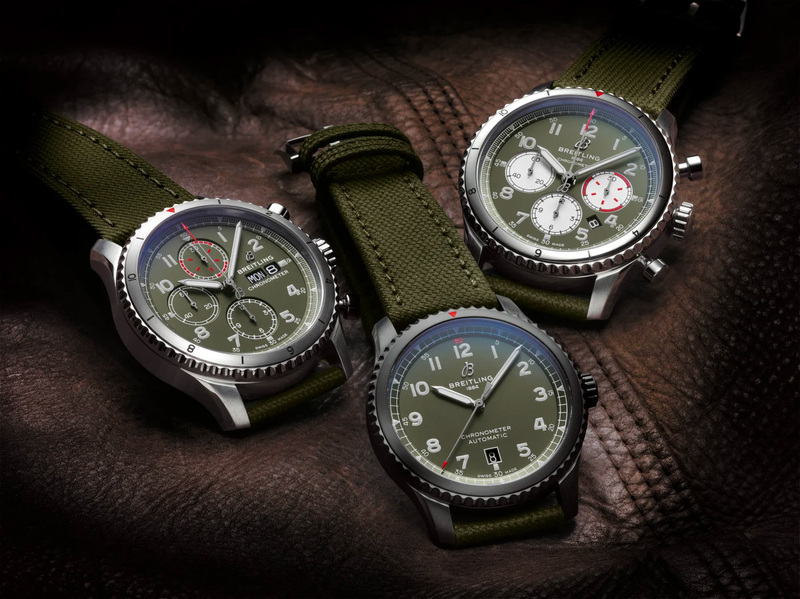 Fans of the 45mm naval-inspired titanium-case chronograph will be pleased to learn they’ve brought it back in an updated & more lightweight design as the Avenger Bandit.